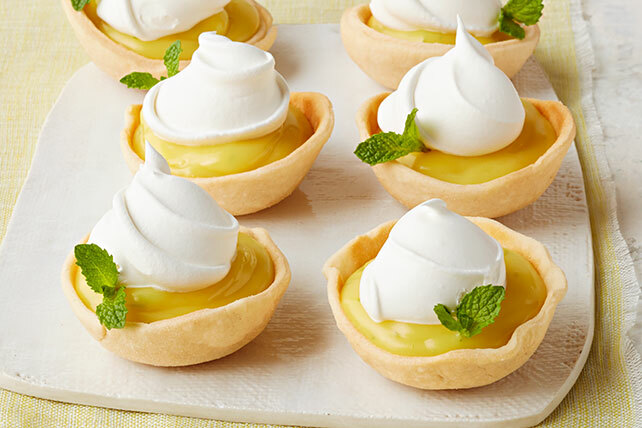 Whip up mini mojito pie! Enjoy big citrus flavor in these bite-size tropical treats that will have you making more. Unroll pie crust on lightly floured cutting board. Roll to 12-inch diameter. Use 3-1/2-inch cookie cutter to cut pastry into 9 rounds, rerolling scraps as necessary. Place 12-cup muffin pan upside-down on work surface. Press 1 pastry round onto bottom and down side of each of 9 muffin pan cups. Bake 9 to 11 min. or until golden brown; cool completely. Carefully remove pastry cups from pan. Combine dry gelatin mix and mint in small bowl. Add boiling water; stir 2 min. until gelatin is completely dissolved. Stir in lime juice. Beat pudding mix, milk and lime zest in medium bowl with whisk 2 min. Pour gelatin mixture through fine-mesh strainer into pudding. Press strained mint leaves into strainer with back of spoon to remove as much liquid as possible. Discard strained solids. Whisk pudding and gelatin mixtures until blended. Refrigerate 30 min. or until thickened. Spoon pudding mixture into pie crusts. Refrigerate 30 min. or until firm. Top with COOL WHIP before serving. For best results, stir the dissolved gelatin 2 min. as directed in recipe to ensure the gelatin is completely dissolved and the mint flavor is fully developed. Garnish with additional fresh mint leaves just before serving.